Comments: Vader is obsessed with finding the young Rebel who destroyed the Death Star, believing him to be the offspring of Anakin Skywalker. Following up on a probe droid lead, Vader identifies the Rebel base on Hoth but arrives too late, as the last of the Rebels flee Echo Base. 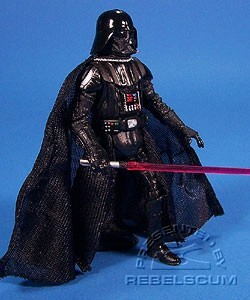 Darth Vader is a repack of 2006's TSC Darth Vader SAGA-038.